Gosh, I owe Alexandra Palace an apology. 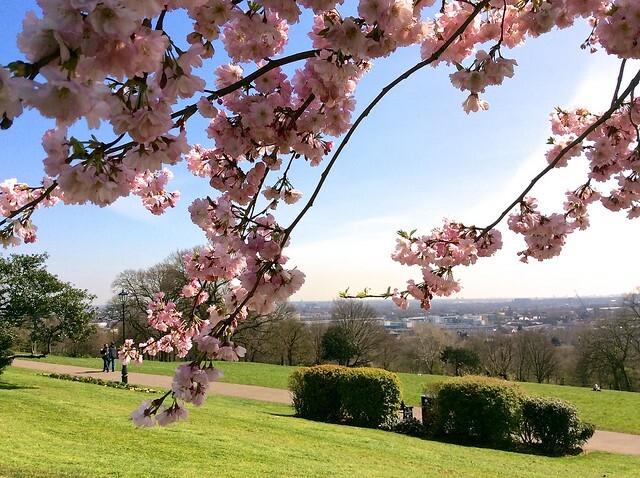 I posted my London Cherry Blossom Guide two years ago and I’ve been updating it regularly since then, but not once have I mentioned Alexandra Palace, even though I live nearby. It just never occurred to me it was a top cherry blossom viewing spot, and somehow I never went there in cherry blossom season. Until now, that is. And now I know better. 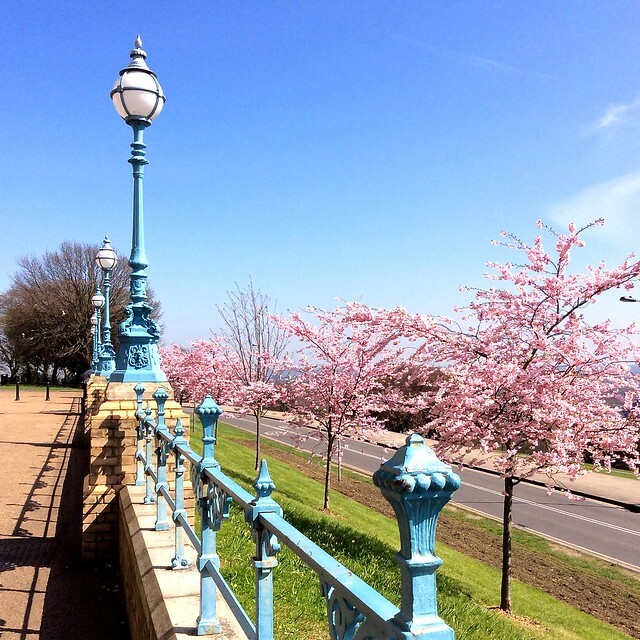 As North Londoners know, Alexandra Palace, also known as as Ally Pally, or the People’s Palace, stands on a grassy hill above Crouch End and commands spectacular views across the city. It also boasts a skating rink, boating lake and other attractions. 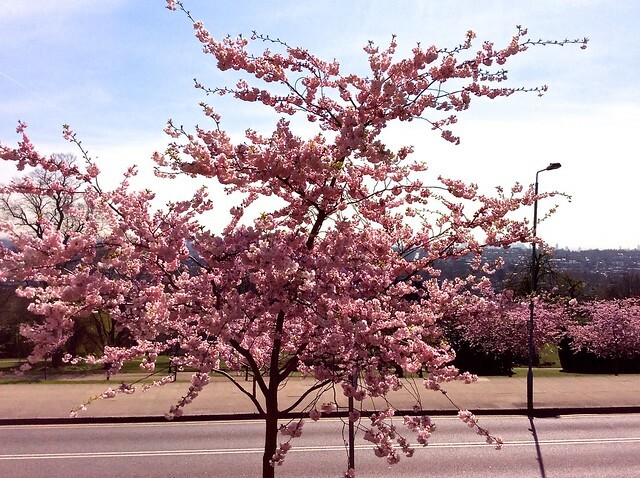 And, as I’ve just discovered, nearly thirty cherry trees, which are in full bloom right now. There are two lines of them leading up to the Palace entrance, plus some more planted just below the terrace. 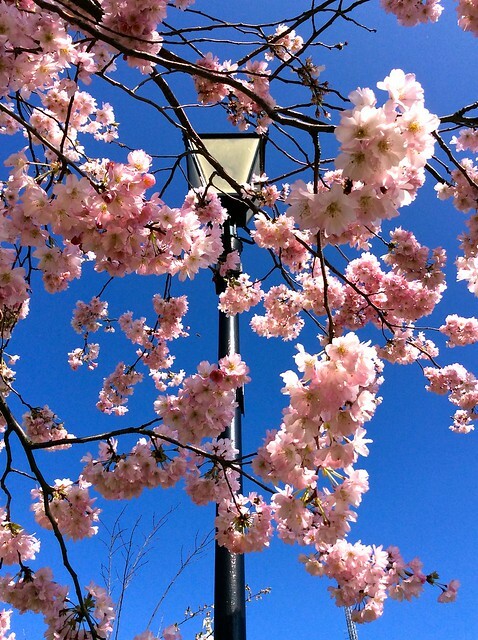 It’s the perfect spot for your hanami (cherry blossom viewing) picnic. There’s plenty of grass under the trees, the Palace as a backdrop, and of course that spectacular view. 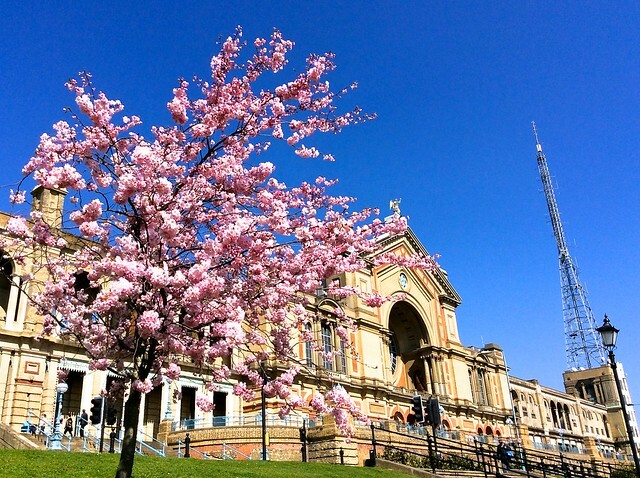 Alexandra Palace is home to the BBC studio from which the very first television broadcast was made in 1936. And an old Victorian Theatre which is due to be restored after lying dark for more than sixty years. You can read more about the plans on the BBC website. If you don’t want to walk up the hill, the W3 bus will take you there. The Palace also has its own railway station, with trains running from Moorgate. This entry was posted in Cherry Blossom, Flowers and plants and tagged Alexandra Palace, BBC studio, flowers, London, nature, plants by Fran. Bookmark the permalink. 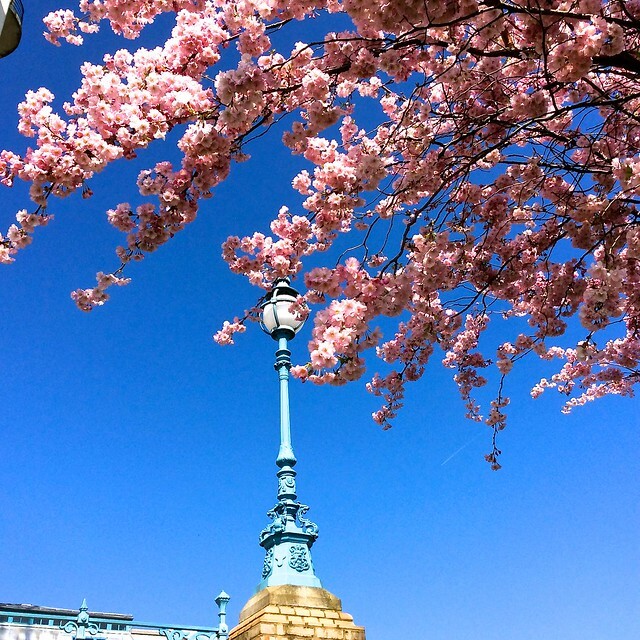 Two thoughts – first lovely to see the pink blossom against the pale facade of the building and, secondly, fantastic to see it against something blue – whatever that is??! Miserably, here in Norwich we’ve still not got the warm spring sunshine – yet. 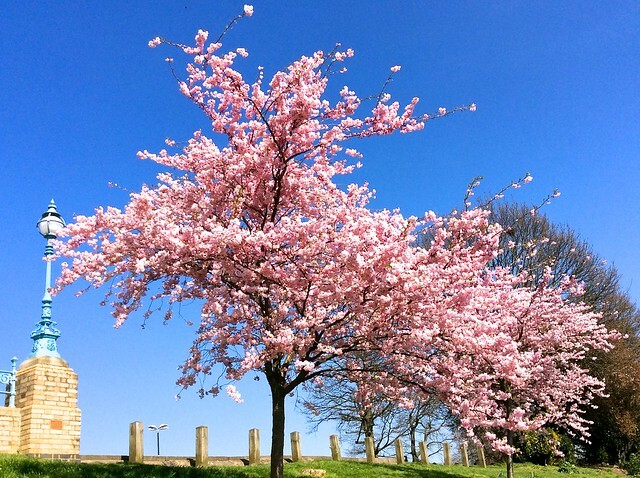 Looks like you had beautiful whether for your stroll round Ally Pally. 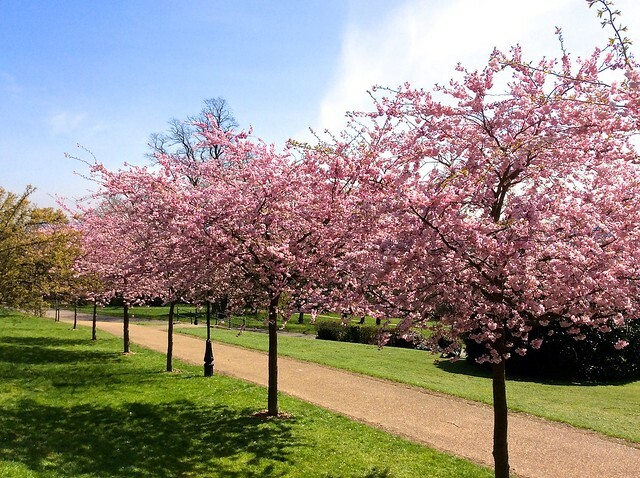 Yes, it was a fabulous day yesterday – let’s hope the sun reaches you soon! 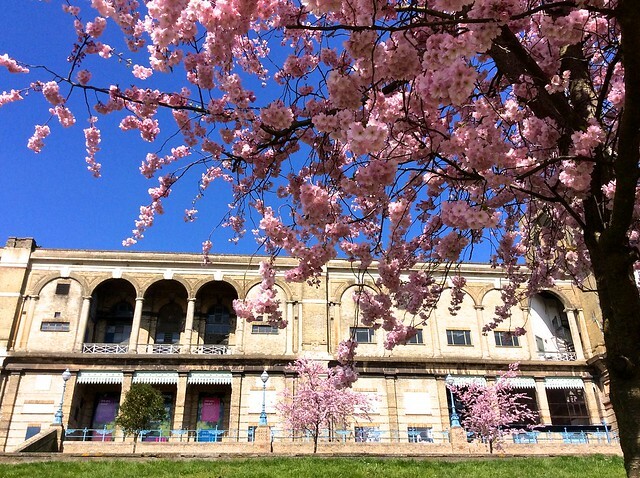 I love the Ally Pally, which I knew best when it housed parts of the Hornsey School of Art in the 60s and 70s, though I have a feeling the cherry trees post date this. So many people have good memories of Ally Pally. It’s a real North London landmark.